Newbery Honor author Shannon Hale and New York Times bestselling illustrator LeUyen Pham join forces in this graphic memoir about how hard it is to find your real friends—and why it’s worth the journey. 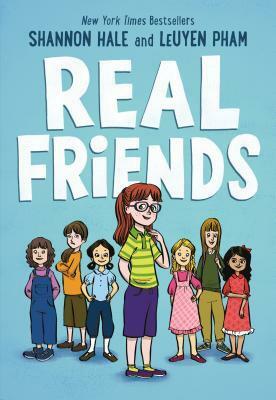 Real Friends is a semi-autobiographical graphic novel about a girl who is trying to find her place at school and at home. Dealing with subjects like bullying, anxiety, and OCD, Real Friends is a must read for any child or parent who is going through something similar. I think that this should be a book that every parent should have their children between 2nd and 5th grade read. Shannon could be any child, in any school with these very real problems and I think it would do a child good to read a graphic novel where the character is going through the same things as they are. That way they can see that there is a light at the end of the tunnel and that one day, those that were picking on them eventually end up in their shoes. Shannon did come across as someone who would do anything to stay in “The Group”. Anything and when I was reading those chapters where she was doing that, I wanted to cry for her. She was trying to so hard and they just treated her like she was invisible. But as she got older and more mature, she slowly began to realize that it wasn’t her. I think that when she broke up with “The Group” and started making friends with the older kids in her grade (she was in a 5th grade/6th-grade split class), that she realized her worth. Adrienne and Jen annoyed the ever-living out of me. Adrienne for not being a true friend to Shannon. She allowed those girls, well mainly Jen, to bully Shannon, spread lies about her and just make Shannon’s life miserable. What really got me annoyed with her was when she allowed her brother to scream at Shannon and then agreed with some of what he said. And don’t get me started on Jen. What a miserable, unhappy girl. She found an easy victim in Shannon and took every opportunity to let her know how unpopular she was or how lucky she was being allowed to hang out with them. I will say that I agreed with Shannon’s decision at the end of the book. I know the author had some reserves about writing that part of the story the way she wrote it and I will say…I agreed with the way it was written. The drama at home was pretty hard to read too. Shannon’s sister, Wendy, was portrayed as a bear for most of the book and she was so mean to her. I was a little shocked that there was physical violence shown. That being Wendy smacking Shannon around and I started to get angry at Wendy. But, the more the story went on, the more that the author let little things slip about Wendy. About her struggles with bullies and making friends at school. Which made me understand why she acted the way she acted. The end of the book was very well written and I loved the afterward that the author wrote. Why: I enjoyed reading this book and thought that the message that was included in it was one that every child should read. This was the 2nd graphic novel that I have read and I really liked it. The illustrations were fantastic!! Why: This is a middle-grade book, written for children between 8-12. There is some slight violence in the book but it is going with the storyline about bullying and drama at home.